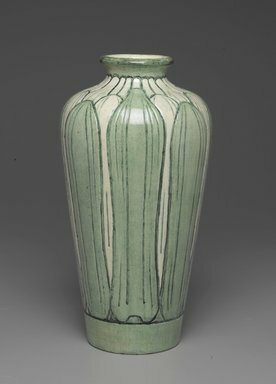 Earthenware vase with pale green and white glaze. Narrow cylindrical form flaring out towards top. Shoulder in concave curve to small mouth with out flared lip. Vase is covered with pattern of overlapping long narrow leaves of Egyptian inspiration. Condition: Good, conservation report in object file.